Aren't our police juswunnerful etc etc. 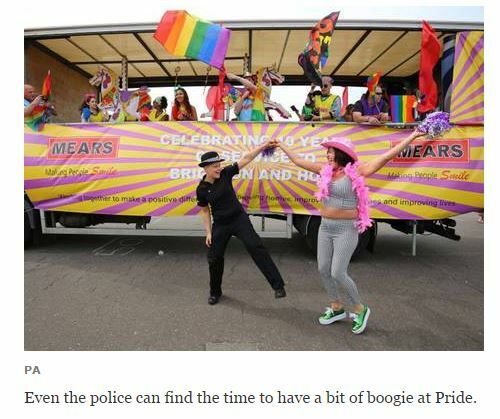 Not long til they can run that evergreen classic photo; a policeman dancing with a black woman at Notting Hill Carnival. 9 pictures here. As per, you can't see any of their faces (bar, possibly one), just some queens hidden by drag. Gay shaming after a gay pride event, yeah! Update: Same bunch of PA photos on Guardian online - but look, this one has another camouflaged drag queen AND a copper!!! NB George Montague, the fabled 'oldest gay in the village', and his husband as of Friday, Somchai. So why do we only see the back of their heads?